Nikolay Mikhailovich Karamzin (Russian: Никола́й Миха́йлович Карамзи́н; IPA: [nʲɪkɐˈlaj mʲɪˈxajləvʲɪtɕ kərɐmˈzʲin]; 12 December [O.S. 1 December] 1766 – 3 June [O.S. 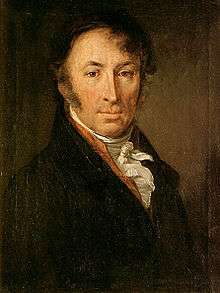 22 May] 1826) was a Russian writer, poet, historian and critic. He is best remembered for his History of the Russian State, a 12-volume national history. 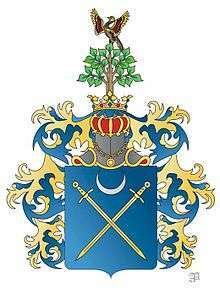 Karamzin was born in the village of Znamenskoye, in Simbirsk Governorate on 1 December (old style) 1766. His father was an officer in the Russian army. His background was Tatar. He was sent to Moscow to study under Swiss-German teacher Johann Matthias Schaden; he later moved to St Petersburg, where he made the acquaintance of Ivan Dmitriev, a Russian poet of some merit, and occupied himself with translating essays by foreign writers into his native language. After residing for some time in St Petersburg he went to Simbirsk, where he lived in retirement until induced to revisit Moscow. There, finding himself in the midst of the society of learned men, he again took to literary work. In 1794, Karamzin abandoned his literary journal and published a miscellany in two volumes entitled Aglaia, in which appeared, among other stories, The Island of Bornholm and Ilya Muromets, the latter a story based on the adventures of the well-known hero of many a Russian legend. From 1797 to 1799, he issued another miscellany or poetical almanac, The Aonides, in conjunction with Derzhavin and Dmitriev. In 1798 he compiled The Pantheon, a collection of pieces from the works of the most celebrated authors ancient and modern, translated into Russian. Many of his lighter productions were subsequently printed by him in a volume entitled My Trifles. Admired by Alexander Pushkin and Vladimir Nabokov, the style of his writings is elegant and flowing, modelled on the easy sentences of the French prose writers rather than the long periodical paragraphs of the old Slavonic school. His example proved beneficial for the creation of a Russian literary language, a major contribution for the history of Russian literature. He did not, however, live to carry his work further than the eleventh volume, terminating it at the accession of Michael Romanov in 1613. He died on 22 May (old style) 1826, in the Tauride Palace. A monument was erected to his memory at Simbirsk in 1845. ↑ Russia and Ukraine: Literature and the Discourse of Empire from Napoleonic to Postcolonial times McGill-Queen's Press 2001, page 68. ↑ Еськова, Н. (2000). "ПРО БУКВУ Ё". Nauka i Zhizn (4). ↑ Еськова, Н. (2008). "И ЕЩЁ РАЗ О БУКВЕ Ё". Nauka i Zhizn (7). Wikimedia Commons has media related to Nikolai Karamzin.